Identification. The name "Mayotte" comes from the Swahili word for Mahore, Maote . The name "Mahore" appears in the French adjective mahorais . Mahore identity is based on Comorian, Malagasy, French, and Creole cultural traits. Comorian culture is prevalent on Mayotte, the fourth island in the archipelago, which also has cultural characteristics of its own. Location and Geography. Mayotte, with an area of 144 square miles (374 square kilometers), is the easternmost island in the Comoros off the coast of southwestern Africa, and geologically the oldest. The coral barrier reef that surrounds it has created one of the largest lagoons in the world. Mayotte is made up of several small islands, including Petite Terre, where the airport is located, and Grande Terre, the main island. Demography. The population grew from 45,000 in 1975 to 131,000 in 1997, with half the people being under age 20. The population of Mamoudzou is 32,000. In 1841, the island had three thousand inhabitants; twenty years later, there were twelve thousand. These people were mostly Mahorans, African slaves and bondsmen, Malagasy, and Comoreans from other islands in the archipelago. There were also a few dozen Creoles, some Indian merchants and European planters, and a few Arabs. Linguistic Affiliation. Mahorans speak Shimaore , a form of Comorian that is similar to Shindzuani , which is spoken on the next island. More than a third of the population speaks Shibushi or Mahoran Malagasy, which is similar to the Sakalava spoken on Madagascar. These two languages have influenced each other, principally through borrowings. French is the language of public services, education, and foreign exchange, but sixty percent of the population does not speak it. The majority of children attend a Koranic school to learn Koranic text. Symbolism. The coat of arms that was adopted in 1982 shows a crescent moon representing Islam and two ylang-ylang flowers, the island's principal agricultural product, against a blue, white, and red background that represents the French flag; the border stands for the coral reef. Two seahorses recall the shape of the island, reposing on the motto Ra hachiri ("We are vigilant"). Emergence of the Nation. Inhabited in the eighth century and organized into chieftainships and then a sultanate that often was threatened by Nzwani, Mayotte became a French possession in 1841, after a period of Malagasy raids and the violent seizure of power by a succession of usurpers. At the outset a sugar colony and then the administrative center of the archipelago, Mayotte lost that distinction in 1958, when the capital was moved to Moroni (Ngazidja). When the Comoros gained independence in 1975, Mayotte chose to remain French to benefit from French development funds, which residents feared it would no longer receive. within the French republic is considered provisional and will be reviewed in 2010. Ethnic Relations. Mahorans, who have family ties to the inhabitants of the other Comorian islands, especially Ndzuani and the northeastern part of Madagascar, are faced with immigration from the neighboring islands (officially 26,000 Comorians and 1,500 Malagasy), where the standard of living is lower. From Ngazidja, men come to marry Mahoran women to obtain French citizenship and gain the right to enter France. Poor farmers from Nzwani arrive clandestinely. Despite this migratory pressure, violent social reactions are rare. People from France, called wazungu (singular, mzungu ), make up 4 percent of the population. They work mainly in the municipal administration and are in a position of authority. A different lifestyle, a higher economic level, and a lack of understanding of the local languages reinforce their separation from Mahorans. The typical two-room house is built of cob (earth mixed with rice straw), coconut fronds, or raffia. A program of social housing put in place in 1975 encourages the construction of houses made of earthen bricks and cement painted in bright colors: Sixty-five percent of the population lives in houses made out of solid materials and 75 percent of houses have electricity. Televisions are more numerous than refrigerators. 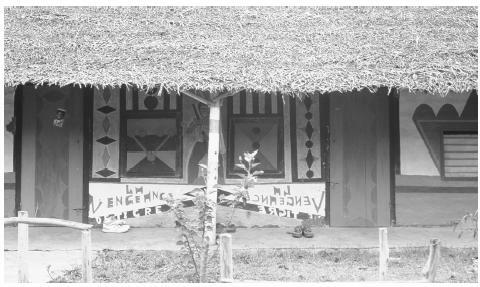 The dwellings of bachelors ( banga ), built and occupied by themselves, are decorated with painted murals done by adolescents. The mosque and the royal tombs from the sixteenth century in Tsingoni, the capital of the sultanate, have been restored. Some sugar factory chimneys from the nineteenth century, a reminder of the colonial period, also have been preserved. Food in Daily Life. The food of the common people is similar throughout the Comorian Islands, with rice the staple of the daily diet, along with manioc and other root vegetables, plantains, fresh and dried fish, and milk from grated coconuts. Products imported from France and South Africa are more common in Mayotte, which has several supermarkets. Food Customs at Ceremonial Occasions. Mayotte follows traditional Comorian practices. Rice, curdled milk, and meat are eaten at celebratory meals. Basic Economy. The agricultural and food-producing sector has declined (falling from 50 percent to 12 percent of household activity), to the benefit of the cash sector (administration, building, and public works and business). The flow of public funds is the driving force in the economy. Land Tenure and Property. Any nonregistered land is supposed to be in the public domain. This is the case with many personal and family fields that are held jointly. As in the Comoros, common knowledge or an Islamic property act often takes the place of modern property registration, which is subject to tax. The local administration is conducting a cadastral survey of the island. Commercial Activities. Because of its remote location, tourism remains underdeveloped. Major Industries. Agriculture, including livestock raising, and fishing are the major industries. Also important to the economy are industries involving the preparation of plants and spices for export. Trade. Mayotte imports food and building materials, primarily from France. Exports items, especially to France, include ylang-ylang (perfume extract), coffee, cinnamon, copra, coconuts, and vanilla. Division of Labor. The wazungu hold the majority of responsible positions in administration and teaching. Work on the land is in disfavor. Most Mahorans wish for office jobs, and many young people who have finished school lack employment. Classes and Castes. The primary basis of social distinction is a person's level of education and wealth. The French make up the leisure class, along with local elected officials (among them a number of Creoles descended from planters), merchants, and salaried workers. The older families in villages enjoy the respect of their fellow citizens, as do religious officials (imams and heads of brotherhoods). Indian merchants have a network of relations that are based as much on family ties as on business. Symbols of Social Stratification. Mahorans dress in both the European style and the Comorian fashion, combining in different ways the business suit, the muslim robe (kandzu) , and the embroidered cap (kofia) . A veil for the head is part of a well-dressed woman's attire, worn with a dress or the local wrapped garment. Young people follow styles from abroad. Speaking French has contradictory connotations, depending on the context: It is a sign of education in administrative circles but is offensive at the village level, where "acting like a mzungu " is considered a sign of a bad attitude. Government. Mayotte, as a territorial collectivity of France, has an administrative organization based on the French département with a legislative unicameral General Council, consisting of nineteen seats. Its members are elected by popular vote to serve three-year terms. Mayotte elects one member to the French Senate. The executive power is vested in the prefect, who represents the French government. Leadership and Political Officials. The Mahoran People's Party, the historical defender of the nationals link to France, is opposed by political groups organized by a younger generation of leaders. The proposal to integrate Mahore with France dominates the political agenda. The village population remains far removed from the political strategies of the local elite. 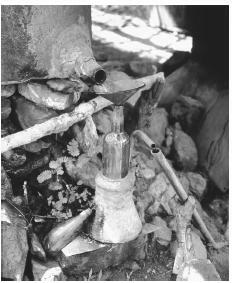 A woodland ylang-ylang perfume distillery. Ylang-ylang is the island's principal agricultural export. theft, clandestine employment, and sexual assaults. The authority of the Islamic judges is exercised in civil matters ranging from personal interpretations of local law to the transmission of wealth and property. The services provided by the state have to a large extent replaced the social control that used to be exercised at the village level. The individualization of social relationships and the pressure to consume are indicative of the transformation of moral values. Strain on the fabric of the family, has made social regulation difficult. Military Activity. France garrisons a regiment of the Foreign Legion in Mayotte, as well as a naval detachment. Local volunteers may obtain professional training through a program known as le Service Militaire Adapté . In recent years, development initiatives have affected health, education, roads, communication, and the construction of new infrastructure. There has been an increase in the number of wazungu officials. Sports, music, and dance are the most common activities sponsored by associations. Local television broadcasts their special events, such as the deba or the wadaha . The deba is a Muslim prayer that is sung and danced with the head and hands by veiled young girls covered in gold and flowers. The wadaha, the dance of the pestles, is an exercise in manual dexterity and seduction, conducted to a vigorous musical rhythm. Division of Labor by Gender. There has been a lot of incorrect commentary about matriarchy in Mayotte because of the activity of women in the inner circle of the Mahoran People's Party, which politicians have exploited to the greatest extent possible. As in Comoros, important and normative public roles are held by men. Women are active groups within the family and in social networks. The Relative Status of Women and Men. The combination of matrilocal residence and polygamy has produced the same effects that it has in the Comoros. Women have a degree of material and psychological security but suffer complete instability in conjugal relationships. With age, women acquire a position of authority within the family that is comparable to that of men. Marriage. The Great Wedding ceremony arusi is a festival. Shorter than they are in Ngazidja, these events reveal the degree to which Mahorans want to preserve their ancient social values and affirm their social position in a way that is specific to the local culture. These ceremonies also provide an opportunity for entertainment (music and dance), as well as social interaction. Separation and remarriage are common. Domestic Unit. As in the other Comoros, a house is given to a woman by her family at the time of her first marriage. Maternal parents have a strong presence in the domestic unit. Inheritance. Inheritance is not as exclusively matrilineal as it is in Ngazidja. Family land is handed down to the children either as a whole or after division, and a field is set aside for girls who need one. Houses and jewels are handed down to girls. Kin Groups. Filiation is bilateral, but as in the Comoros, because the family lives in the mother's house, there is a strong maternal bond. Mahorans pride themselves on having a far-reaching parental affiliation, which remarriages encourage, and maintain those bonds by visiting relatives in other villages. Infant Care. Family care habits are the same as in Comoros, where children are cherished, but in Mayotte, health services for mothers and children are of much higher quality and are more accessible. Child Rearing and Education. Western education encourages individualism, while Comorian education favors obedience and conformity to the group. Children thus are torn between two languages and two cultural systems. Despite spectacular progress in school and preschool facilities, half the students fail when entering high school, can not find an occupation, and lose their competence in French. Some ten thousand youths are members of sports clubs, most of them boys. Girls are sheltered. Pregnancy outside of marriage is always considered dishonorable even though abortion is legal. The mother gladly keeps the child if the father agrees to marry her quickly. Higher Education. Approximately six hundred Mahorans receive scholarships to study in universities in France, and about the same number of high school students are enrolled there in programs that are unavailable in Mayotte. Conduct is based on respect for elders and Comorian customs of public appearance, but the Western education that is given in middle school and high school offers alternative values that are sometimes contradictory. Religious Beliefs. Sunni Islam of the Chafeite rite is the major religious affiliation, accompanied for part of the population by a cult of possession of Mahoran spirits known as patros and Malagasy ones known as trumba . A decorated Banga house. Houses made of earthen brick and cement are encouraged by the government social housing program. sheikhs . There, spirits of the earth or of ancestors are summoned and partially Islamized rituals are performed. Mayotte has had rapid development of maternal and infant care and health services, with several rural clinics and two hospitals. Intervention by traditional practitioners and rituals of possession by spirits remain the preferred way of dealing with personal or relationship problems that may result in illness. Rapid changes in society have affected school-age adolescent girls in particular. French as well as Muslim holidays are celebrated. Support for the Arts. The Mahoran Center for Cultural Action, which receives public funding, supports artistic endeavors, and encourages the blending of local and metropolitan French culture. Literature. A body of oral literature is being assembled at the Office of Cultural Affairs and has been partially transcribed. Young Mahoran fiction authors have begun to write in French. Graphic Arts. Traditional pottery has become scarce, but painting has begun to appear, practiced by wazungu artists and Mahoran youth. Performance Arts. Theater in native languages (Comorian or Mayotte-Malagasy) is performed in villages, combining humor and social criticism (parent-child relations, marriage, polygamy). Contemporary music blends Comorian and Malagasy styles with Creole and European genres. Mayotte has no museums. The Cours Normal School houses a library, but access is restricted. Abdou, S. Baco, Brulante Est Ma Terre , 1990. Allibert, Claude. Mayotte, Plaque Tournante et Microcosme de l'Ocean Indien Occidental , 1984. Blanchy, Sophie. La Vie Quotidienne a Mayotte (Comoros) , 1990. ——. Dictionnaire Mahorais-Francais et Francais-Mahorais , 1996. ——. "Les Mahorais et Leur Terre: Autochtonie, Identite et Politique." In Droit et Cultures , 37: 165–185, 1999. ——, and Zaharia Soilihi. Furukombe et Autres Contes de Mayotte , 1991. ——, Noel J. Gueunier, and M. Said. La Maison de la Mere: Contes de Lile de Mayotte , 1993. Breslar, John, Bernard Chatain, and Leon Attila Cheyssial. Habitat Mahorais, Etude Analytique et Perspectives , 1979. Brolly, Mabe and Christisan Vaisse. Mayotte , 1988. Gueunier, Noel J. "Lexique du Dialectee Malgache de Mayotte." Etudes Ocean Indien 7: 1986. ——. Contes Comoriens en Dialecte Malgache de l'Ile de Mayotte , 1994. Lambek, Michael. Human Spirit: A Cultural Account of Trance in Mayotte , 1981. ——. "Virgin Marriage and the Autonomy of Women in Mayotte." In Signs: Journal of Women in Culture and Society 9 (2): 264–281, 1983. ——. Knowledge and Practice in Mayotte: Local Discourses of Islam, Sorcery, and Spirit Possession , 1993. Rombi, Marie-Francoise. Le Shimaore (Ile de Mayotte, Comoros): Premiere Approche d'un Parler de la Langue Comorienne , 1983. This is a great website; perfect for researching on this country, Mayotte, especially when doing school projects!!! The site is coolest but in some places like agriculture field and investiment it not indicated or clear shown. We have a school project and this is PERFECT for it. We have to present a country and my group picked Mayotte. As you can see, my name is Mayotte. My father told me that there were 2 Mayotte brothers living in France. One brother went to Mayotte Island and the other to Canada/USA. I am from the brother that went to Canada. I am wondering if there may be some truth to the Mayotte Island part of this story. I would love to visit Mayotte Island even if the story has no truth to it. 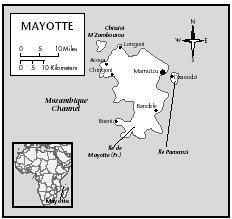 I discovered Mayotte Island in 4th grade geography class and have wondered about it ever since. My father’s family was French Canadian and I doubt any of them went to Mayotte, but I, too, would love to go there.